Different ingredients are used to create different skin outcomes and appeal to varied age groups and skin types. In the beauty product market, there is a demographic shift from Baby Boomers to Millenials. Research shows that Millenials place less emphasis on gender and ethnicity and more emphasis on positivity, confidence and psychological and emotional health. The research also shows that the Millenials, ages 20 to 36, are the ones spending the most money on beauty products and are driving a shift in the skin care market to include more natural ingredients. They are media savvy and know what they want. 73 % of all women use skin care products while 1 in 5 women use anti-aging skin care. Anti-aging skin care benefits all age groups and masks can help rejuvenate skin quickly. Some of the reasons your skin may need a mask are: lack of sleep, too much sugar in your diet, and drinking alcohol. Other skin damaging factors are simply found in the environment – the sun and smog particles do plenty of everyday damage. 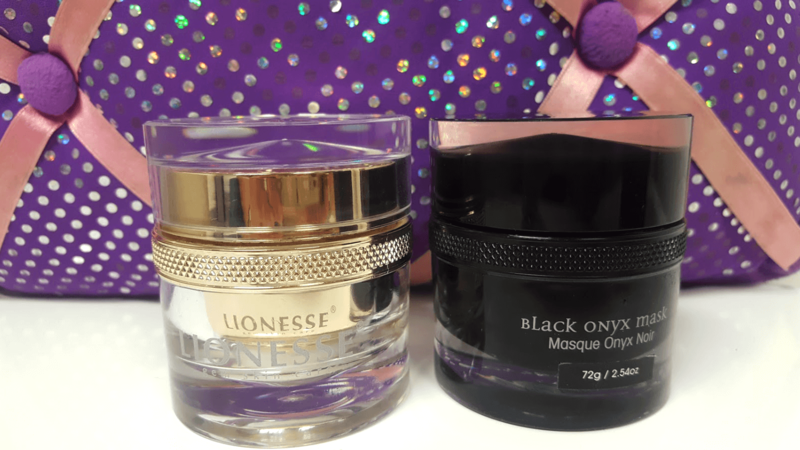 In reviewing two different masks, I found that each has many of the anti-aging and other ingredients necessary to fight against skin-damaging external elements. I hope to give my skin a short break and offer it some hope and sympathy. I live in a dry sunny climate and have spent way too much time in the sun and wind. It is an increasingly urban area with lots of traffic and although we don’t have ‘smog alerts’ like we did when I was a kid, I know the particles are there and so does my skin. 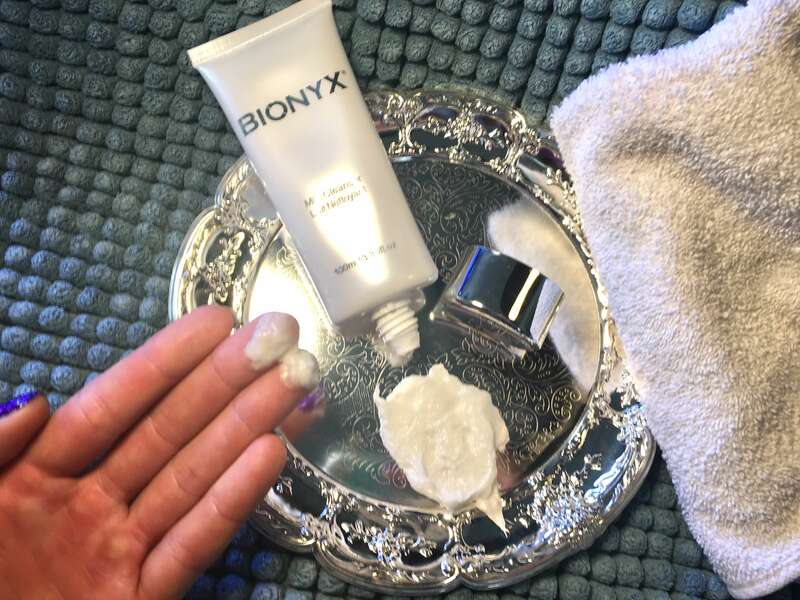 I had a chance to try out the Bionyx Milk Cleanser and the Bionyx Platinum Foaming Sheet Mask. I am hoping for a short ‘Spa Day’ feeling and rejuvenation for my tired skin. 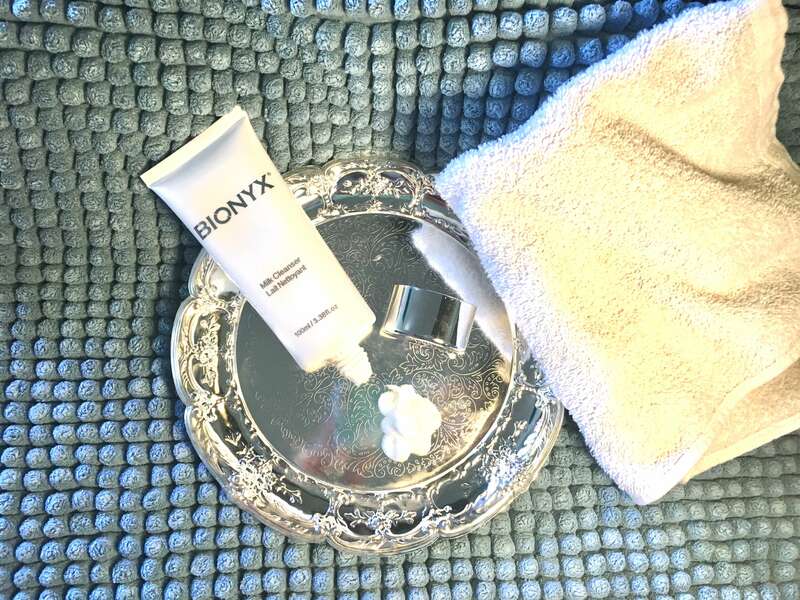 The BIONYX Milk Cleanser came in a slightly textured gun metal gray box with shiny silver chrome letters. The package was sleek and clean and simple. It was easy to identify as a BIONYX product because of the Large logo on the box. The contrast in the textures between the box and letters was nice and is not overwhelming or cheap looking. The name, Milk Cleanser, was written in English and French on the box as well as the tube. This was a nice touch, as the cleanser assumes the quality of an expensive French soap by association. 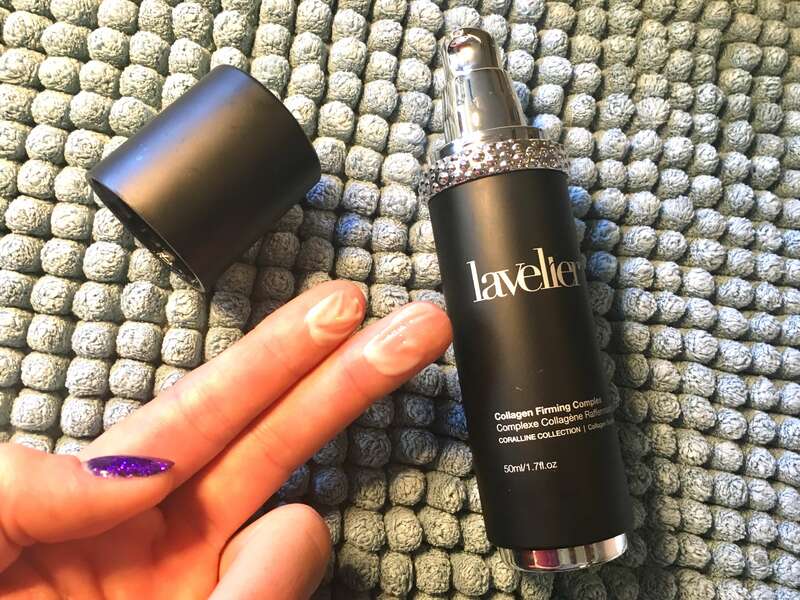 The Milk Cleanser comes in a flat white tube with a shiny silver chrome lid that can serve as the base of the product so that it can stand upright. Upon unscrewing the cap, I found that the cleanser was sealed which informed me that nobody had spoiled it yet. It was like a very thick moisturizer and I had to squeeze the tube very hard to make some of the cleanser come out. It smelled like fresh and clean springtime soap. The user is instructed to use this product daily and to rub in circular motion all over the face and rinse with cold water. I squeezed some out on my hand and found that it did not foam or bubble very much like soap. It was more like a paste or lotion and did not turn to foam or liquid in my hand easily when water was added. It did not seem to rinse off quickly either, but left my skin feeling soft and smooth and rejuvenated. I was puzzled with its lack of soapy foam and its reluctant rinse, but the result was worth it. There was no tightness that begs for a moisturizer after the rinse and no oily residue either. It was a welcome change to my face washing regimen. According to the list of ingredients on the package, the creamy white Milk Cleanser contains vitamins C and E and jojoba and musk oils. The description on the box says that it is designed especially for sensitive skin. Some quick google research showed me a few of the many benefits of using these products, with the most important benefits including: skin protection, cleansing, cell rejuvenation and moisturizing. The Milk Cleanser contains several skin-rejuvenating vitamins and oils; Vitamins C and E and also Jojoba and musk oils. Vitamin C, also known as ascorbic acid, is an antioxident and helps protect skin from the sun’s UVA and UVB rays. Vitamin C helps stimulate Collagen production which slows down as we get older. A couple of more things that Vitamin C helps with is to even skin tones and lighten spots. Vitamin E is another skin superstar ingredient in the Milk Cleanser. This vitamin fights free radicals helping reduce wrinkles and speeds up cell regeneration. Jojoba oil has antibacterial properties and actually helps to control acne. It also resembles natural sebum and helps regulate the skin’s own oil production. Musk oil contains Vitamin A, also known as ‘Retinol.’ It is an astringent and has antiseptic as well as antifungal properties. Using these ingredients every day would essentially renew dull skin and help reduce fine lines. The market for skin cleansers has recently grown by 5.4% according to an infographic article on womansmarketing.com. This cleanser would be a welcome addition to a woman of any age. 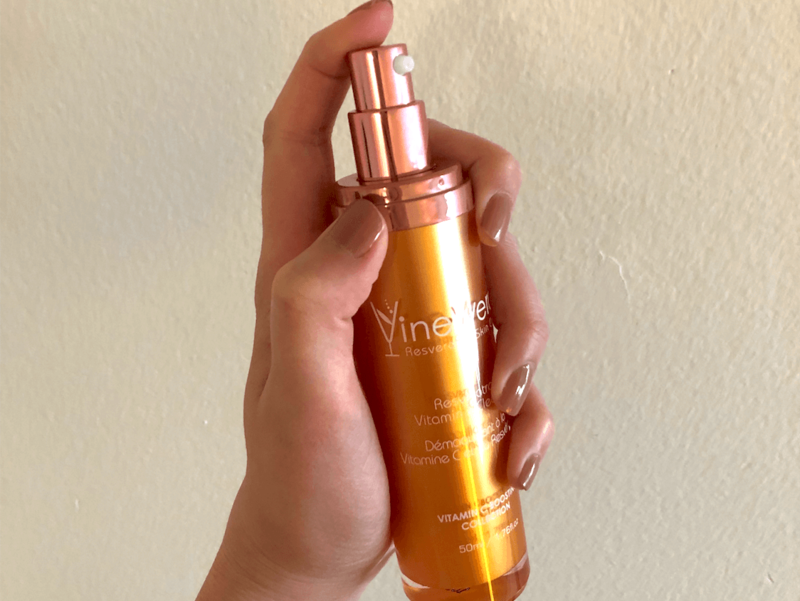 All women would benefit from the ingredients in this product, especially those like me with sensitive skin and a few wrinkles that are a product of my environment more than my age. After two weeks of use, I have found that the Milk Cleanser does the job. The jojoba and musk oils in the Milk Cleanser helped my skin daily with their astringent and antibacterial properties. My pores look smaller and my face glows with clean new skin. I have found that it works better in the shower and spreads more evenly over wet skin. My face feels soft and smooth and maybe even a few of the fine lines have diminished. The Milk Cleanser is easier to rinse with the stream of water in a shower too. It rinses cleanly and doesn’t leave my face oily or stripped of all moisture requiring an immediate application of cold cream upon leaving the shower. The only problem with this product is that the cleanser is very thick and takes some real effort to squeeze it out of the tube. I do really like the Milk Cleanser because of the way my skin feels when I use it. It feels like I gave it a drink of water from the outside and it somehow soaked it in. I would love to keep using it. The BIONYX Platinum Foaming Sheet Mask is a cloth sheet mask. Sheet masks are not just for Millenials, they are also gaining popularity in other populations. Recent marketing research shows that older populations are catching on. It is found that sheet face masks are gaining popularity among the elderly across the globe, especially anti-aging formulation sheet face masks due to which the market for sheet face masks is booming significantly. I am not quite in the ‘elderly market’ – I am somewhere between the Millenials and Baby Boomers, the generation that they don’t really talk about in market research, but I do live in a place with many skin stressors and my skin could use a boost from a sheet mask. Skip any kind of rinsing altogether and instead seal in the effects of the mask with your favorite moisturizer, which you should apply immediately after use. Living near a busy freeway, this is a must for me. Cucumber juice is also listed as an ingredient in the mask. Cucumber helps reduce puffiness and and inflamed or irritated skin. It has Vitamin C and caffeic acid in it. The classic package for the Platinum Foaming Sheet Mask is a classic matte white box with light silver-gray matte letters. The look is clean and simple and doesn’t really reveal the quality of the product inside. The BIONYX logo is in a large all caps font that runs vertically, bottom to top for the length of the front of the box. The logo is definitely noticable but not overwhelming. The name of the product, Platinum Foaming Sheet Mask, is written horizantly in small letters in English and in French below. Including the French name makes the mask appear to have higher standards than a product that is only sold in the English speaking world. Everyone knows the French know their beauty products. The instructions on the back of the box included 4 small pictures showing how to use the mask. Opening the box, I found 10 sealed pouches. The front side of the pouch was white and has the same logo and name as the box. The back was black with platinum colored font. They are smooth and elegant in their simplicity. The design is flawless. The pouch was easy to tear open and it smelled fresh and clean, almost like springtime, and soap and foamed up right away. 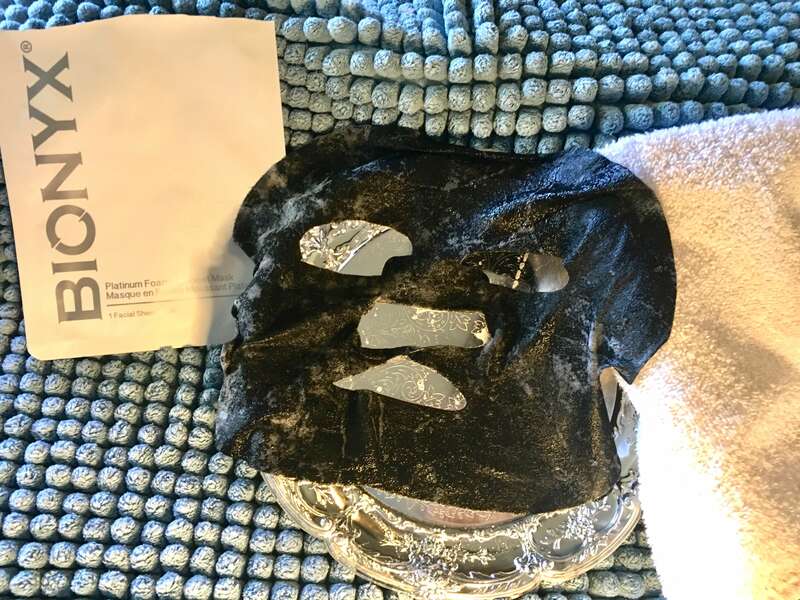 Using the Platinum Foaming Sheet Mask is wonderful – it is truly a luxurious addition to my skin care routine that is very addicting. My skin feels renewed, rehydrated and well cared for. After reading about the properties of charcoal and platinum powder and what they do for skin, I was very impressed with the result. I had not ever tried a skin care product with either of the ingredients. My skin is now cleaner, softer, and smoother. I am not sure which ingredient is the cause of this result; it is probably the combination of all of them. The mask is a once-a-week indulgence, and having sensitive skin, I would be reluctant to try it more than that. It is not harsh on my skin at all, but rather it has very potent ingredients. 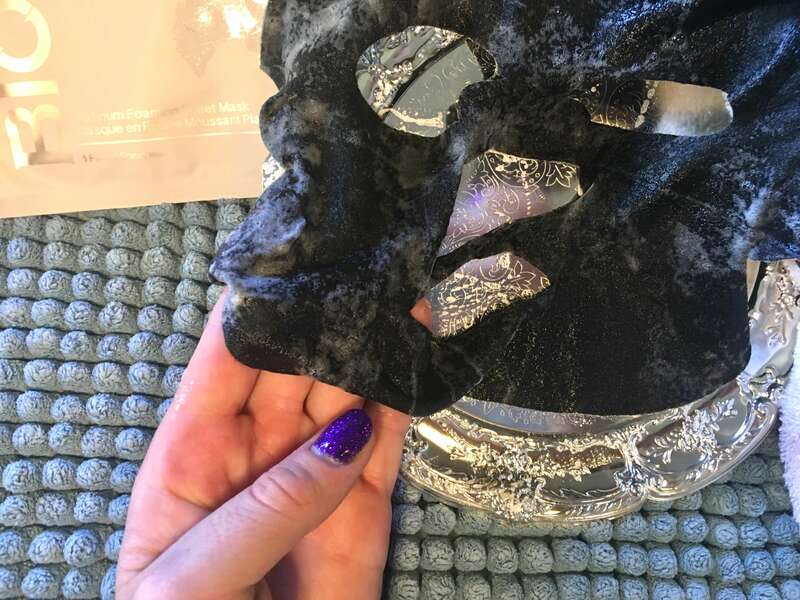 The package admonishes the recipient to use the mask once a week for best results. 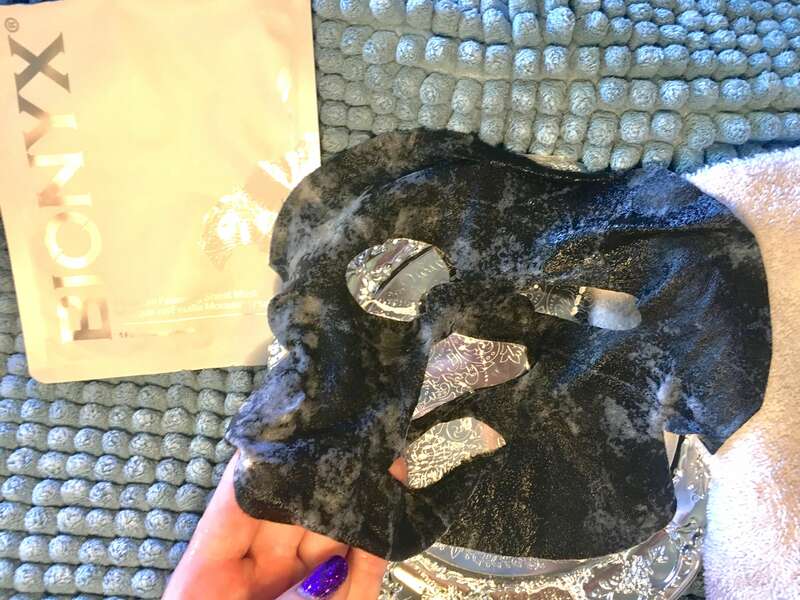 The mask is also so luxurious that to use it more than once a week seems like it would be too great of an indulgence and take away from the exclusive ‘spa day’ feeling it imposes. In conclusion, the chic but understated packaging and the in-demand ingredients of both of these products appeal to today’s wide audience of skin-care product consumers. Men and women from any demographic would find that either of these products could suit them. ‘Spa day’ is for everyone and we could all use a 15 minute break! The milk cleanser sounds amazing. I really want to try this it sounds amazing. The milk cleanser sounds like something I would like and I’m really LOVING that foaming face mask!! This is the second time I saw it and it just makes me want to try it even more! I really want to try out the milk cleanser. A definite spa like experience at home. Yes, I need to give these a try. These sound like they’d do wonders for my aging skin! Thanks for the info! Thanks for this incredible review. I would love to try this. Sounds amazing! The milk cleanser sounds interesting. Odd that it doesn’t suds but sounds like it still did a great job! Research shows that Millenials place less emphasis on gender and ethnicity and more emphasis on positivity, confidence and psychological and emotional health. Milk cleanser. I’ve never used a foaming sheet mask. It sounds intriguing. My Mom loved sheet masks, so they are right about older women liking them, but I think they’re great for busy people too. They can work for everyone. I really ought to try the Platinum Foaming Sheet Mask. I love that it could make my pores look smaller as your review states!! The sheet mask looks just lovely! I would love to give it a try. This product sounds exactly like what I need. I guess I can say I’m an older woman since I’m 53. Usually I was my face while I’m taking a shower and this product sounds like something I would use everyday rather than whenever like I do with my other cleanser!! Thank you!! I would love to try this! I got my daughters and I face and feet masks for tonight! I definitely would like to try the Foaming Sheet Mask. This sounds very interesting. I have never used a sheet mask. Thank you for the informative article. i would love to try this, thanks much!! Love Vitamin E’s properties, this would be great for my skin! I am an older woman and the sheet masks would be perfect for my skin. 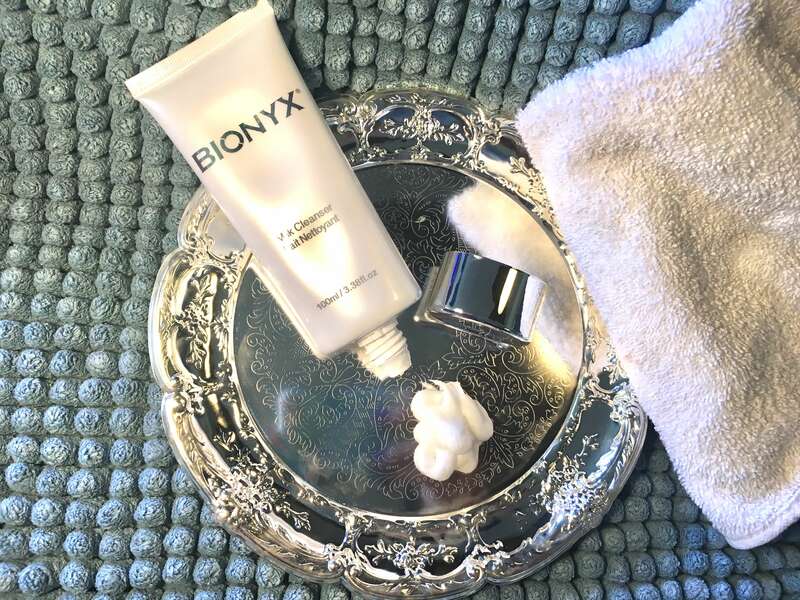 Love that the BIONYX Milk Cleanser felt like an expensive French soap – not drying or greasy! I would love to try this ! This sounds really nice! I need to give it a try. When you use the right skincare, you don’t need all that stuff on your face! Facial cleansers and sheet masks like these from Bionyx are perfect examples of great products giving you great skin! I think the younger generation has become a little obsessed with makeup, while the older and wiser (LOL) generation like myself are starting to take better care of our skin and looking at skincare products like we used to look at makeup. After all, you don’t need to conceal radiant skin! And while I wish I had known and practiced this say 10 years ago, I didn’t, so now it’s time for me to catch up and tune into the new products, like these gems from Bionyx! Who doesn’t want to be a platinum girl anyway? Thanks for this great article! This looks so awesome would love to try it. Skincare is a hot topic these days. Companies are finally producing & making products for women. The products are all good. However, some products are better than others. Following a daily facial routine supports a healthy and glowing face. It is so important to start with a clean & fresh face. I love using face masks for the clean & fresh feeling on my face after cleansing my face with a good product. This looks incredible. I have very sensitive skin, but this looks so perfect! Thanks for all the great info!